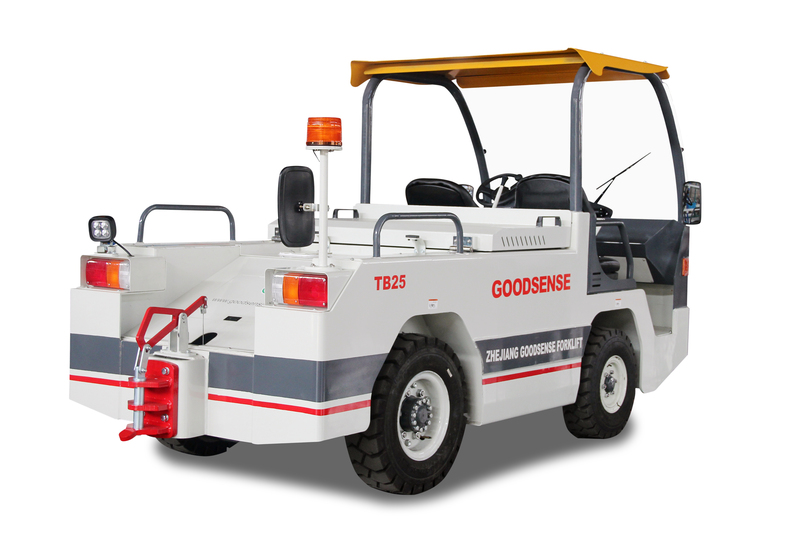 TB25 Electronic Baggage Tractor is designed to tow goods and luggage for airport, mineral companies, harbors, railway station etc. 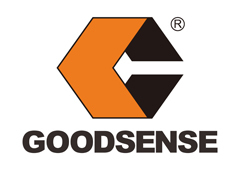 Developed by Goodsense Forklift Co., Ltd. Low noise, zero displacement, environment protection is the great advantage differentiates the electronic from the diesel tractors. 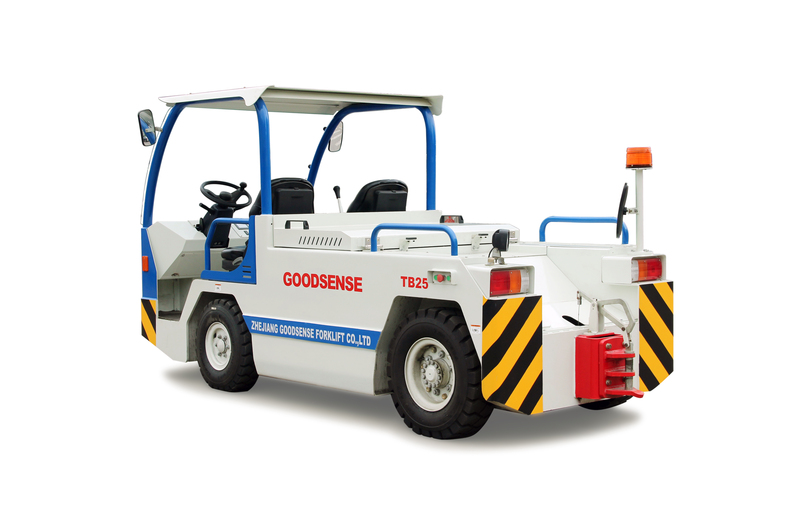 The tractor is widely used in all fields like airport, railway station, post office, food industries for the excellent outlook, high working efficient, easy maintenance. 1. Electronics: Good performance, precise control electric control system with regeneration braking, ramp braking system and fault auto-diagnosis function. The good reliability results from the excellent accelerator, power connector and AMP drain wire harness. The battery volume, timer, driving condition, auto-diagnosis information is shown on the LED meter in the cabin. 2. Outlook: Arc design open cabinet equipped with the front windshield provides a wide sight and beautiful appearance. The battery is easy to maintenance and replace with 90 degree open cover. 3. Steering System: Hydraulic steering system with horizontal cylinder steering axle provides an easy and flexible operation. The steering axle is suspended connected to the car frame with special rubber shock absorption device. The suitable steering wheel can be easily operated equipped with one hand control handle. 4. Driving System: The stable and reliable driving axle and gear-box has a big load capacity. And the maintenance-free big power AC driving motor has a strong power with good reliability. 5. Braking System: The tractor adopts Vacuum power hydraulic double circuit four wheel braking system with flexible and reliable braking performance with regeneration braking function. 6. Towing Device: The driver can control the hooking and decoupling by rear cable device equipped with rear hook mirror. A rear micro switch is provided to micro control the forward or backward of the tractor for individual coupling or decoupling. An emergency power switch is used to stop the tractor in case of emergency. 7. The suspension seat is designed to reduce the shock during the driving.